For a time, ever since my life transformation I’ve experienced a weird phenomenon with certain men. The guy approaches me. He’s extremely interested, has a nice conversation with me, but then leaves without asking me for my information to connect again. At first I think, “well damn, did my breath stink or something?” LOL But of course I just shake it off. I finally realized what was happening. It had nothing to do with my looks or what I said. It had everything to do with the confidence and determined attitude I exuded when talking to these particular guys. I was not the type of woman they were looking for. You see, each of these guys were slime balls. Players (or wannabes). They were fishing. They looked at me from afar, liked what they saw, and thought they’d try their luck at running game on me for a potential one night stand. But when they stepped into my energy they became uncomfortable. They realized that I wasn’t a pushover and I wouldn’t be scammed into their beds that night. So they moved onto easier prey. In the past, my desperate, needy and eager to please energy would have led the no-good guy to pursue me all night long, right up until I landed in his bed! They love women like that — those women are easy to conquer. So this is a really good thing. My energy is finally up to a place where the slimey guys can’t stay in my presence for long. When you’re “vibrating” at a high level of positive energy and have high self esteem, bad guys just can’t tango with you. They can’t fool you. It’s a scientific fact. They will run scared with their tail between their legs. On the other hand, this also leaves you in a place where decent, wonderful men (gems) can be drawn to you in a most magnificent and perfect way. They ARE up for the challenge. 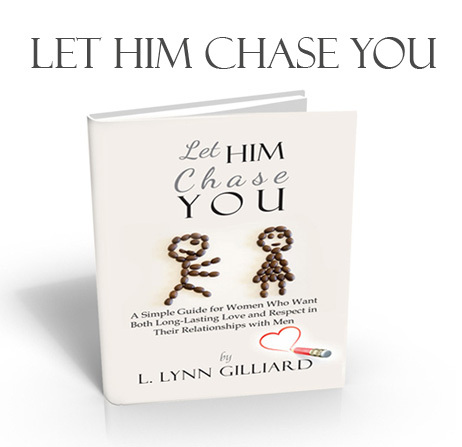 You just have to open up your energy to receive the right type of guy in your life and then LET HIM CHASE YOU!